“Our brand position as a franchisor is to Improve Your Community. Improve Your Life,” said U.S. Lawns President Ken Hutcheson. 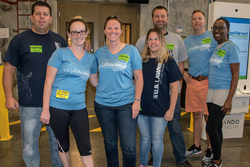 U.S. Lawns, a commercial grounds care company with a nationwide franchise network in over 250 locations, is proud of their Home Office Team and local franchisees for volunteering time to help Second Harvest Food Bank of Central Florida. In just one Saturday afternoon, U.S. Lawns, along with other volunteers, were able to organize and box up 8,138 pounds of food for a total of 6,782 meals. Second Harvest Food Bank works with 550 local feeding partners and last year provided 54 million meals to families, kids and seniors. Through their distribution network, this food is often in the hands of people in need later the same day it arrives in their warehouse. They are also a member of Feeding America, a nationwide network of more than 200 food banks that helps feed people across the country after natural disasters, like hurricanes, floods, fires, tornadoes, etc. Second Harvest also transforms dozens of lives directly every year. Economically-challenged adults graduate from their 14-week culinary training program and are placed in ‘better than minimum wage’ jobs that set them and their families on a path to self-sustainability. U.S. Lawns is committed to doing their part to give back to communities nationwide, and honored to support Second Harvest Food Bank because they reflect the essence of the U.S. Lawns vision. About U.S. Lawns Founded in 1986, U.S. Lawns services commercial customers through a nationwide franchise network in over 250 locations, providing professional grade, customized grounds care and snow & ice management services to corporate campuses, retail centers, industrial parks, multi-family residential communities and other commercial customers. For more information, visit http://www.USLawns.com and http://www.USLawnsFranchise.com.